We focus on your project vision—from concept to commissioning. Ennis Electric’s design group has the capabilities to provide in-house engineering for small to medium size projects. We employ an experienced mix of engineers and design professionals offering our clients complete engineering and technical support. Ennis Electric was an early adopter of 3D coordination methods. By staying up to date with intelligent modeling technologies, we are able to excel in BIM implementation. This has empowered us to improve coordination, streamline prefabrication and produce higher quality work. We take responsibility of coordinating with other trade contractors in clash detection exercises and resolving systems conflicts. 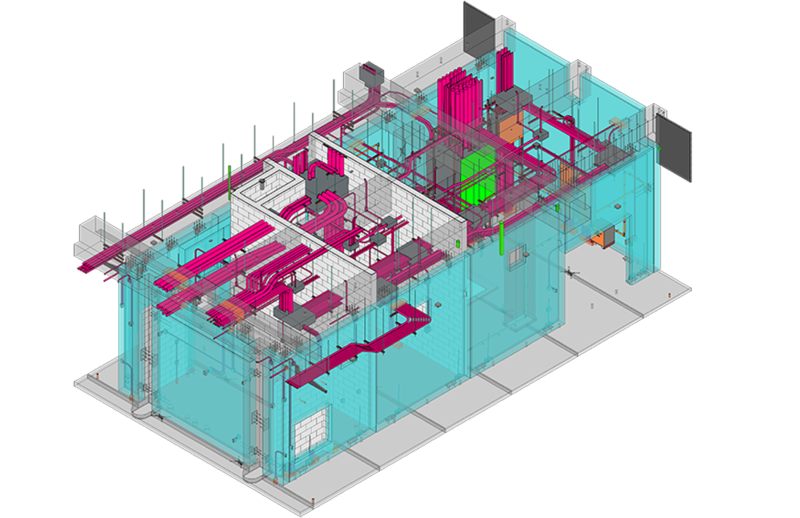 BIM allows us to identify problems early in the project and virtually create solutions with great accuracy. Our BIM team comprises detailers and coordinators. Our detailers are experienced in the latest technologies including AutoCAD MEP, Revit, and Navisworks. Coordinators work hand-in-hand with our detailers and are experienced electricians who have a long tenure with Ennis Electric. Our BIM team integrates with our engineers and field installers to collaborate on design, prefabrication and installation.